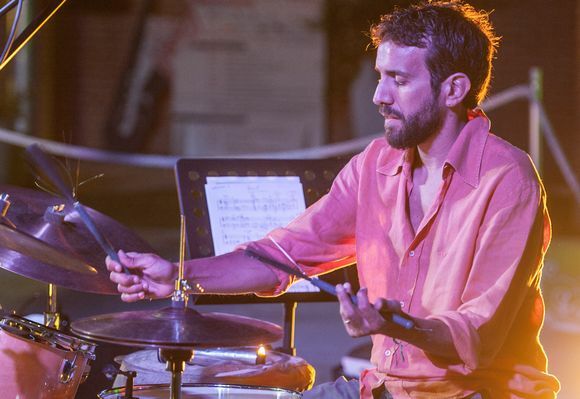 Tommaso Cappellato is a fiercely eclectic Italian drummer, band leader, dj and composer whose work runs the gamut from freeform techno to hip-hop production and jazz improvisation. Cappellato earned his BFA in Jazz Performance at The New School University, and spent the better part of his twenties in NYC exploring a range of styles and techniques. In 2004, he formed the hip-hop group Brohemian along with Brooklyn MC Yah Supreme. The following year, he traveled to Senegal to record with Guinean percussionist and singer Salif Bangoura. Among his more recent endeavors are the 14-piece Tommaso Cappellato Orchestra, the spiritual jazz tribute group Astral Travel (which memorialises the late pianist, composer and arranger Harry Whitaker), and a drums-and-synths solo project, Aforemention. He also plays in cosmic jazz collective Upperground Orchestra, established in 2002 by Lebanese producer Rabih Beaini. In 2015, Cappellato partnered with visionary Egyptian producer Maurice Louca and bassist Bashar Farran to combine shaabi with elements of experimental, electronic, rock and traditional Middle Eastern music. Over the years Cappellato collaborated with Michael Blake, Don Byron, Mark De Clive-Lowe, Steve Grossman, Jon Hendricks, Debbie Harry & The Jazz Passengers, Enrico Pieranunzi, Enrico Rava, Kurt Rosenwinkel, Bill Ware's Vibes, Underground Resistance, Harry Whitaker and others. In 2013 he was granted the JAJ Award by Shuya Okino of Kyoto Jazz Massive in Japan acknowledging him as the year's best new artist.